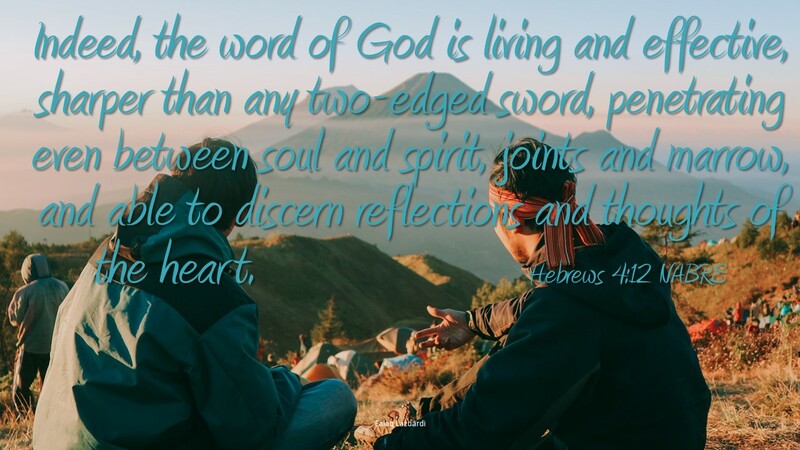 In this homily called Hebrews in this forth chapter we read a discussion about God’s word and how it is living and effective as it addresses Sabbath rest. God finished His work and rested and therefore God’s rest has been available since the beginning of Creation. But some did not enter into rest because of their disobedience. However God speaks again years later and says Sabbath rest still remains for us. God declared rests for our own good. God knew we would not take time away, we would not stop and take in what he had done and plan for the next week. So God created rest for us so we would welcome that rest. We continue reading that the word of God is living and effective. It should be alive for us, it should impact our lives and who we are. The word of God can review what is in our hearts. The word is able to reveal the sin and unbelief that is in our hearts. The word also enables us to obey God and claim His promises. The word can be our judge, if we listen to it, it can offer us corrections for a life lived off the path or it can affirm our direction for a life lived on the path. God created the Sabbath for us, Jesus came and freed us from sin and reaffirmed the Sabbath rest. We should take rest so we enter into His rest revealing God’s word in our heart. Do you spend time in the word? Do you trust what it speaks to you?